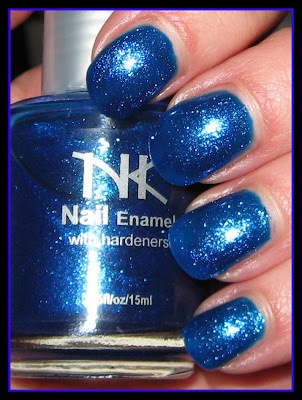 NK (by Nicka K) Royal Blue Frost is definitely not a frost finish, and if I were to see this on their web site, I would likely pass on it. This was a gift from the lovely Lynn, and I think it's gorgeous! The name 'frost' and the color sample on the NK web site do not do this shade justice. Above & Below: I used 2 coats and had no application issues. The top photo is with an Ott lamp, while the bottom photo is shown with a flash. Royal Blue Frost is a deep royal blue with glass-flecked glitter. This is such a stunning finish--like crushed sapphires in a pool of liquid cobalt. The glitter is a shade or two lighter than the base and it twinkles and glows with every move of my hands. I'm going to keep my eye out for this brand when I go in some of the smaller independent beauty supply stores, because if they've got any more like this one, I want them! Amazing! It has the feel of light sparkling over water. I wish they made more like that, too. Have not come across them, though. They have a stunning purple that stains badly. I will let you know if I find any other beauties!! SilhouetteScreams~and just think, it looks much better in real life! Diana~you come up with the best descriptions! Skulda~thank you, I love it! Jackie S.~thanks! It's so sparkly and eye-catching. yah all tips are fine and can be use full for any one who want to use all these in their daily life routine..
Wow! That one is a real beauty of a shade of blue. Looks like a really rich crushed sapphire. Looks beautiful on you. I have a few bottles of this brand. I have no idea where I bought them. I know it had to be online. Hopefully I'll remember where. I'd love to find this one.